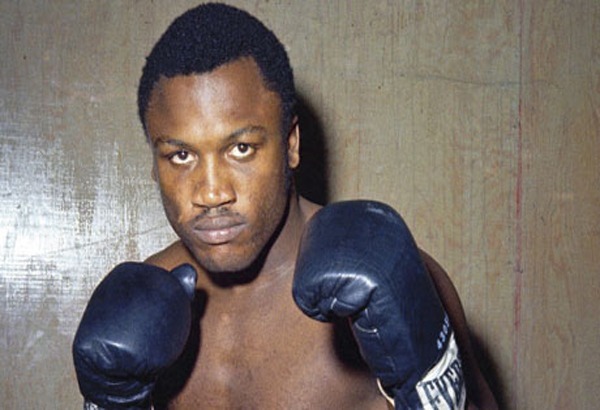 Joe Frazier was born in Laurel Bay, South Carolina, on January 12, 1944. 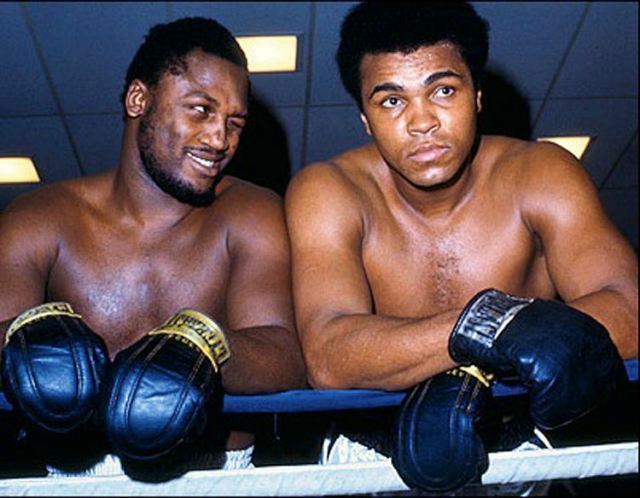 “Smoking Joe” Frazier never set out to set the boxing world alight. He began going to the gym to get himself into shape. However, one thing led to another, and he began competing. He was the youngest of thirteen children. He started his boxing career at age nine, when he rigged up a homemade punching bag of moss and leaves. Twelve years later, after having married at sixteen, he moved to Philadelphia, where he won the Golden Gloves in 1962, 1963 and 1964. He also won American’s only gold medal in the Boxing at the Tokyo Olympics. With a group of businessmen from Philadelphia, Cloverlay, Inc, as his sponsors, Frazier launched his professional career on August 16, 1965, with a one-round knockout over Woody Goss. He oiled up ten straight knockouts before meeting Oscar Bonavena on September 21, 1966. 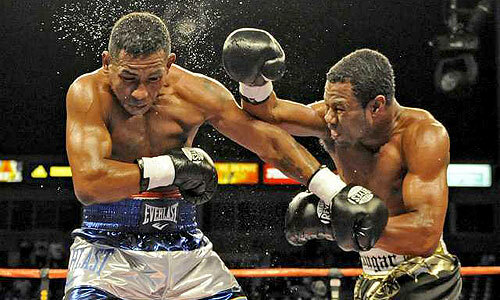 Bonavena floored Frazier twice in the second round, but Frazier rallied to win a ten-round decision. Below is footage of Frazier’s fight against Eddie Machen, in late 1966 the young future heavyweight champion Joe Frazier won by a tenth-round technical knockout. Downed in the first Machen rallied but eventually Frazier’s relentless all action pressure lead to the Ref’s intervention in the last round. Frazier was desperate for the win as he’d just come off a tough battle with Oscar Bonavena. After four more victories, three of which were knockouts, Frazier was pitted against Chuvalo on July 19, 1967. In the fourth round, the tough Canadian was knocked out for the first time in his career. When Frazier fought Buster Mathis on March 4, 1968, he was determined to clear any hint of tarnish from his Olympic medal. Before Frazier went to Tokyo he had won thirty-eight of forty right, His two losses had been to Mathis in the Olympics trials. When Mathis had a broken knuckle, Frazier had the upper hand. “Smokin Joe” flattened Mathis with a left with a left hook in 2:33 of the eleventh round. Frazier became undisputed world champion on February 16, 1970, when the gong rang for the opening of the fifth round and the W.B.A’s champion, Jimmy Ellis, couldn’t come out. After the first round, in which Ellis held a margin, Frazier dominated the match with a steady and relentless style of strong, heavy pressure. As the end if the fourth round approached, Frazier bombarded Ellis’s body and head until the Kentuckian sank to that mat for a count of nine, during which the bell rang. Raising himself at the nine. Ellis managed to get to this corner, when the fifth round gong rang sounded, manager Angelo Dundee motioned to referee Tony Perez that Ellis could not continue. The first encounter with Ali took place on March 8, 1971, at Madison Square Garden before 20,445 fans plus 1.3 million watching closed-circuit theatre TV. Ali who described his own fighting style as “Float like a butterfly, sting like a bee” was slowed down by Frazier’s constant pounding. Ali’s strategy was to let Frazier become arm weary while flicking tiring jabs at his opponent, but despite a 6 1/2 inch disadvantage in reach, Frazier managed to get in under Ali’s jab to land countless left hooks to the Ali’s body. Frazier suffered a swollen jaw and lumps around both eyes, while Ali merely sported a hematoma on the right side of his jaw. Frazier won unanimously with referee Arthur Mercante giving him eight rounds, six to Ali and Judge Bill Recht awarded eleven to Frazier and four to Ali. The only knock down occurred in the fifteenth round, when Ali was dropped for the third time in his career but bounced back after the mandatory eight count. Before facing George Foreman, Frazier fought Terry Daniels in New Orleans on January 15, 1972, then Ron Stander, in Omaha, on May 25, 1972. The odds against his two opponents were 15 to 1 and 20 to 1 respectively. Danis lasted four rounds, Strander, five. On January 22, 1973, at Kingston, Jamaica, Frazier, a 3-1 favourite, was floored six times by Foreman before referee Arthur Mercante stopped the action at 1:35 of the second round before 36,000 fans. Frazier pressed the attack, but was met by a challenger who moved out a step backward. A right to the jaw by Foreman achieved the first knockdown midway into the first round. Frazier got up, exchanged a few punches, and was down again from a series of rights to the head. Again Frazier rose quickly, but obviously dazed, and he was decked a third time as the bell ended the round. As set down by the rules, counting did not end with the bell, but was continued until Frazier struggled up at the count of three. Frazier opened round two with a rushing attack and a left hook to the head, but was a short rally. Foreman, who weighed 217 pounds to Frazier’s 214 pounds, sent the champion to the mat for the fourth time with a left-right to the jaw. Up at the count of two, Frazier was dropped by two left hooks. Again Frazier struggled up but then went down for the last time from a series of punches. Frazier gamely got to his feet, but referee Arthur Mercante looked at his glazed eyes and reeling figure and signalled that there was a new champion. After the George Foreman bout, Joe Frazier went on to fight Joe Bugner in London on July 2, 1973 whom he beat in twelve rounds and then on January 28, 1974. Frazier and Ali fought again at Madison Square Garden in front of 20,746, who paid a live gate of $1,053,688 and a theatre-TV audience that paid £25,000,000. The closed-circuit TV audience reached 10,000,000. The gross revenue for the fight, including foreign film rights, etc, came to $25,000,000. In their previous fight, Frazier went straight in to his opponent while Ali sidestepped and countered. Frazier scored decisively and often to the body. Ali hit only to Joe’s head, but more often and with more power than previously. The most controversial moment of the fight occurred in the second round when referee Tony Perez stopped the fight, thinking he had heard the bell ring. It was a crucial time. Frazier ad Ali in a corner, but Ali spun and jabbed out of trouble and hit Frazier solidly on his puffing cheekbone. After taking a long left hook to the chin, Ali came back to confuse and hurt Frazier with lefts and chopping rights to the head. It was at this point the referee stepped in; stalling the only opportunity Ali had to finish his man. The seventh was Frazier’s big round. The first of several good left hooks connected thirty seconds into the round, stunning Ali. Ali was off his toes, flatfooted, as Frazier again carried the action in the eighth. 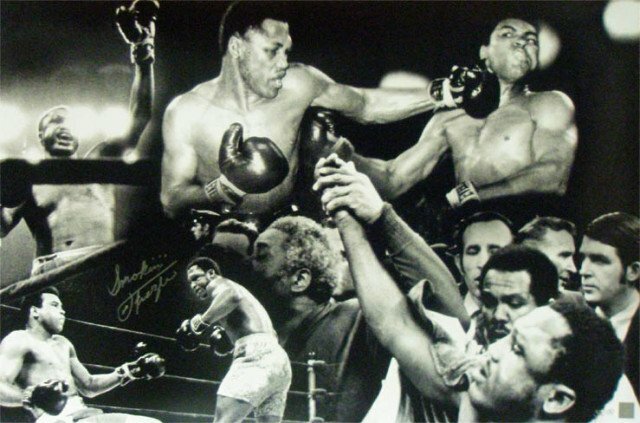 Although Ali was tired, he rallied to outpunch Frazier for the last nine minutes and was awarded a unanimous decision for the twelve rounds by referee Tony Perez and judges Tony Castellano and Jack Gordon. 1975 was, once again, a year of rematches for Frazier, but this time they involved more overseas travel. He met Jimmy Ellis, the man from whom he had originally taken the WBA title, in Melbourne, Australia, knocking him out in nine rounds. That win made him once again the number-one challenger for the world crown, now held by Ali after an eighth-round knockout of George Foreman in the famous “Rumble in the Jungle”. 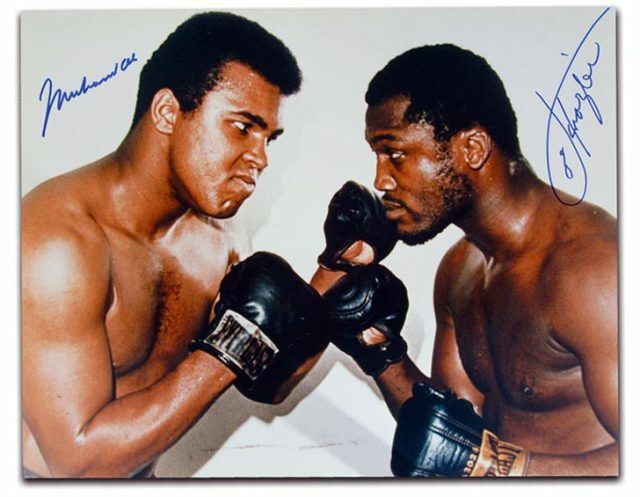 Ali and Frazier met for the third and final time in Quezon City (a district within the metropolitan area of Manila), the Philippines, on October 1, 1975: the “Thrilla in Manila”. Ali took every opportunity to mock Frazier, again calling him The Gorilla, and generally trying to irritate him. The fight for Ali’s title, which was attended by Philippine President Ferdinand Marcos, caused another media frenzy and was seen lives around the world. It was far more action-filled than the previous encounter (there was no belt at stake in the second fight), and was a punishing display that ended when Eddie Futch stopped the fight before the 15th and final round with Frazier sitting on his stool. 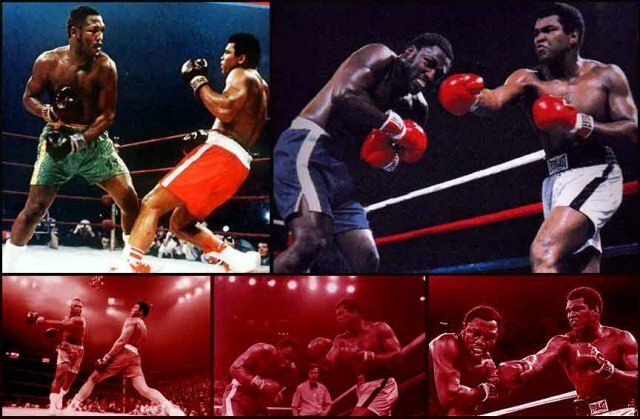 In 1976, Frazier fought and again lost to George Foreman, this time by fifth-round knockout, and retired. In 1981, Frazier attempted a comeback that lasted only one fight, drawing in 10 rounds with Floyd “Jumbo” Cummings in Chicago, Illinois. He then retired for good. 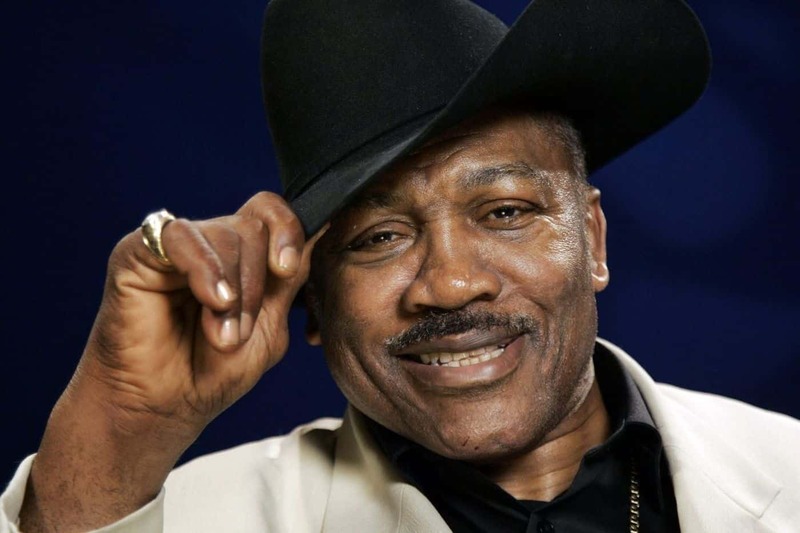 Joe Frazier was diagnosed with liver cancer in September 2011. Within a few weeks, the cancer metastasized. By November 2011, he was under hospice care. He died on November 7, 2011. RIP Smokin’ Joe! We lift our hats to you!